Power-quality analyzers also can help improve overall system efficiency and reduce power-related equipment problems. Building occupants, along with the technology they use and the activities they perform, have become dependent on highly sensitive electronic equipment. This equipment in turn, is highly dependent on a stable, clean source of electrical energy. Unfortunately, most building electrical systems are anything but clean. Even the power supplied to the facility by the utility is not necessarily clean. Heavy electrical loads can cause voltage sags and momentary dropouts at start-up. The operation of non-linear electrical loads generates voltage and current harmonics that increase heating in the system and can damage sensitive electronic equipment. Ground loops or improper system grounding can easily interfere with the operation of audio, video, and computer systems. Power-line noise, either from the utility’s lines or generated within the facility itself, also interferes with the operation of electronic equipment while also increasing heating in the electrical system’s components. The problem for managers is that there are so many different power issues that produce similar symptoms that it is difficult to pinpoint the cause. Beyond that, these power issues can be momentary and random. The best way to detect them is through the use of a power-quality analyzer. Analyzers typically are connected to a facility’s electrical distribution system and monitor both current and voltage in the system. They can detect and record changes in the quality of the system’s electrical power, including dips, surges, fast transients, momentary dropouts, harmonics, power factor, noise, and wave shape. They can log data over a preset period of time for later analysis. Other, less expensive test equipment can be equally valuable in reducing a facility’s energy waste and operational problems. Technicians also can use handheld multimeters and clamp meters to identify and quantify parasitic electrical loads that provide no benefit to the facility’s operation. These tools can help technicians identify under- or over-voltage situations, higher-than-expected current draw of electrical equipment, and ineffective or missing grounding of equipment. All of these situations can increase energy use and decrease system reliability. Departments also have used thermal imaging technology to investigate the condition of electrical equipment in seeking to improve energy efficiency and assess equipment condition. The two most commonly used devices for these applications are the spot radiometer and the thermal imaging camera. In most cases, a technician simply needs to point the unit at the equipment or component in question. Since both types of units are non-contact, they increase the safety of the technician. By recording the results and tracking it over time, technicians can identify trends in both system loading and component deterioration before they result in a service interruption. 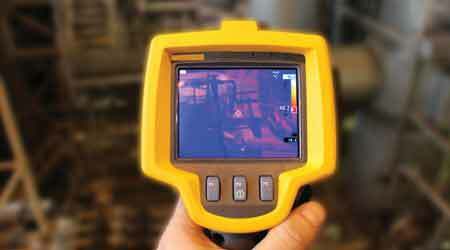 Thermal imaging can help to identify a range of issues in electrical equipment, including panels, circuit breakers, switchgear, transformers, cables, and motors. In all of these devices, efficiency and maintenance issues typically result in hotspots. Loose connections, crimped or corroded connectors, overloaded circuits, and electrical imbalances all result in increased resistance. Increased resistance to electrical circuits results in localized heating, a condition readily detected by thermal imaging. Eliminating these problem spots decreases electrical losses in this system, improving its overall energy efficiency. Just as importantly, eliminating hot spots increases component life and system reliability. For accurate results, the equipment must be under normal operating loads. For all of the above tools, managers must not overlook the need for training. Not only should operators know how to use these tools. They also must have the knowledge to understand the information the tools are gathering, as well as ways to use that information to improve the energy efficiency and the reliability of the facility.